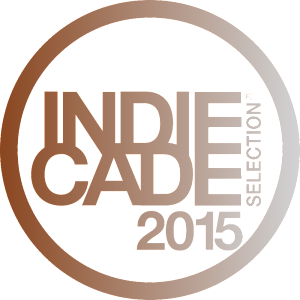 Home / Uncategorized / IndieCade 2015 – How did it go? A week has passed since Indiecade and I finally have the time to sit down and write about it. Just like my post-mortem of PAX East, I’ll go over how it went, what I learned, and what I would have changed. 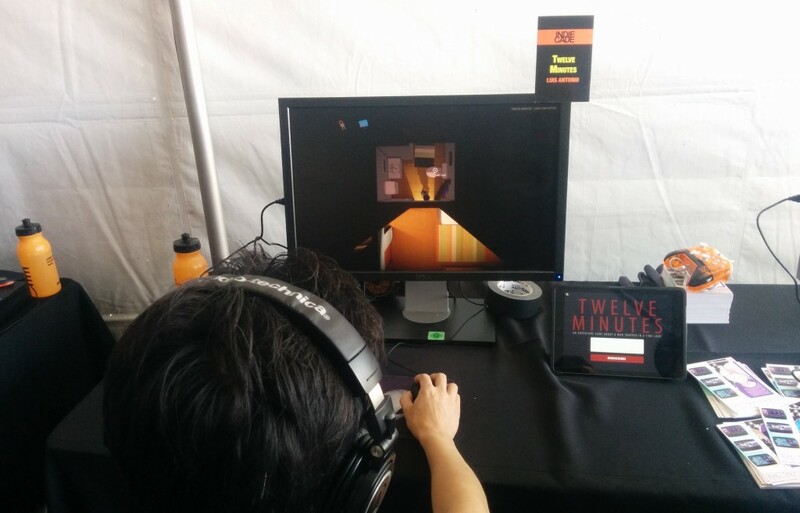 Twelve Minutes was picked by IndieCade’s curators as a Digital Selects Official Selection of IndieCade Festival 2015 and as such, it was playable to the public during the event. Everything was taken care of by the Indiecade team (equipment, signage, booth space) and all I had to do was show up with the latest build of the game. I was able to stay at a friend’s place so my only real cost was the flight, about $80 each way from San Francisco. 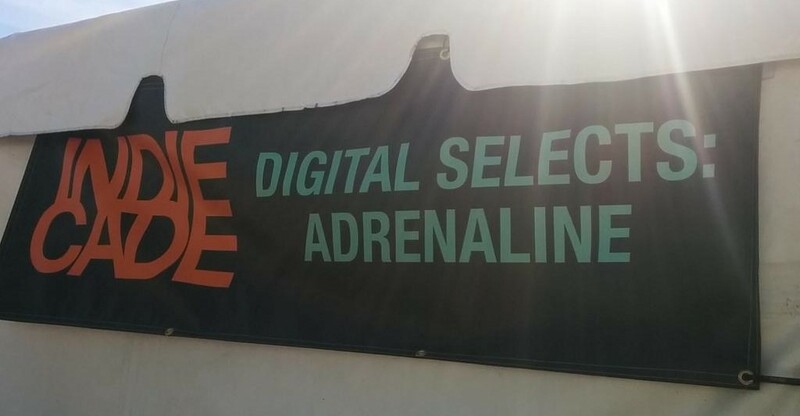 Indiecade is seen as the “Sundance of Indie Games” and I have to say it deserves the title. It’s a 4 day event aimed at game developers rather than the more casual gaming crowd. There are talks, business meetings, parties and lot of socializing, but by far, the best is the opportunity to hang out with friend developers that I haven’t seen in ages, share our love for games and just have a good time together. Showing Twelve Minutes was similar to PAX. You could play for as long as you wanted and people would stay for an average of 30 minutes, usually only leaving if feeling pressured by other waiting attendees, or when realizing that the scope of the game is much larger than they expected and no way they would be able to finish it in one sitting. On the second and third day, people were returning with friends who had told them to check it out, and this for me is the best compliment, it means the experience stayed in their minds long after they played it! I still had the same problem that I faced at PAX, it was rare that someone would want to play the game just by looking at the screen. The current visuals are still placeholder and most of the action happens in the player’s head, so this meant that I had to pitch the concept over and over, and that was exhausting. Also, no matter how fast I am, I’m sure I missed people that would have been interested in the concept if they heard about it. I’ve managed the part of making a strong game where the mechanics, themes and story all work together but now I need to step up on how to spread the word. How good is a game if no one knows about it? The other issue I wanted to tackle, was to make sure attendees remembered Twelve Minutes long after they played other games at Indiecade and went back home. I’m still at least a year away from release so it doesn’t make sense to give away postcards / bookmarks / pins since they will be forgotten in the meantime. What I needed was a way to share updates on the game development so my solution was to bring an Ipad with a “SUBSCRIBE!” button (you can see it in the right corner of the pic above). This allowed me to collect the email addresses of whoever was interested. Once the show was over, I emailed everyone, thanking them for being there and directing them to the website. In terms of press, there were some interviews, a couple of them are already on Youtube and you can check them below. To conclude, I think it was worthwhile going. The fact that the hardest part, to setup the booth and signage was already taken care of, made it fairly easy. I knew I wouldn’t get that much ‘new’ feedback on the gameplay side but I was surprised to get a fresh perspective on what making your own game really means. I’ve been so focused on game design that I forgot that its only one part of a much larger process, where a major step is to know how to promote your game. Being able to understand your market, how to create awareness and reach your audience, creating the right contacts and learn how people perceive what you are doing. I’ve never been a big fan of the marketing and publishing people due to my past experience in big studios (where they are very skilled at polishing crappy products) but still that is a very important skill, and if applied to a quality product, it can makes all the difference. I’m not yet sure what the approach will be for Twelve Minutes, and reading these paragraphs it all sounds pretty obvious, but this was the first time I internalized what it means, and that is the hardest step for me. Now for the easy part, figure out how to do it! I love the idea behind your game and eagerly waiting to play it. I’m not sure whether my suggestion will work for you or not but one idea strikes in my mind and wanted to share it with you. The issue with a screen is that it would be fighting for attention with all the other screens around (and usually festivals are loaded with them). It would also need to be pretty big to read from far away and hanging a screen on most festivals is a lot of work. Also, a static banner allows you to always read the optimal message anytime you look, while a screen you have to stop and pay attention to it. Thank You for the quick response i didn’t expect this much faster response because you are too much busy in you office work and workload of this game. And yes, you are right its lot of work to setup big screens but as you mentioned for screen you have to stop and have to pay attention what is going so i thought this might help people to understand entire game concept. anyway static banner is useful and easy to install too. I have one more query (suggestion?) as Recently i to know about the concept of Augmented Reality as i’m very new in the game programming field so your game is a Top-Down platformer type, so do you have any plans to make this game in Augmented Reality? I think it would look really great and more interactive to user while playing. I know this would not be that easy in the way i’m saying but as from your blogs i came to know that this one is your “Dream Project”. So i guess you will like it growing.